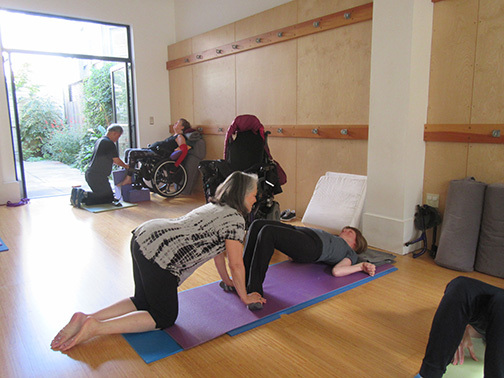 Through a generous grant from the Yoga Dana Foundation, Piedmont Yoga Community is able to offer several adaptive yoga classes for people with disabilities, special needs, developmental disabilities and cancer at various locations throughout the East Bay. These safe, affordable, fully accessible classes are lead by highly trained instructors who recognize the potential abilities and challenges of their student populations. With the support of many insightful assistants and invaluable volunteers, together they bring a wealth of knowledge and compassion to these underserved populations. In keeping with the spirit of yoga, these classes are open to all students regardless of race, creed or financial abilities to pay the standard fees. Over the years students living with a wide variety of disabilities have walked or rolled through our doors. Regardless of an individual's disability, our aim is to provide each student with a beneficial yoga experience. The classes strive to incorporate all areas of a balanced yoga practice. This may mean transferring a student from a wheelchair to the floor, moving impaired body parts in order to achieve a pose, or using props in creative ways to enhance their overall yoga practice. Many of our students have attended classes for a number of years and often acknowledge the warm, inviting nature of our expanding yoga community. These classes are led by JoAnn Lyons who has taught people with disabilities and special needs yoga classes since 1996. She is an instructor for the advanced training program at Piedmont Yoga. She works with a dedicated group of teaching assistants and volunteers to help accommodate for each student's unique challenges by providing physical support when necessary. These two weekly classes are offered on a sliding scale. Piedmont Yoga Community offers a weekly yoga class for adults with developmental disabilities at the Clausen House in Oakland. This class benefits the students by increasing their focus, coordination, flexibility, strength and balance. In addition, the improved ability to follow directions, reduced stress levels and improved relaxation techniques are life skills often learned in this program. Taught by Lin Maxwell and assisted by highly trained assistants, this class is offered free of charge for the participants. JoAnn Lyons offers a workshop annually for teachers & caregivers who are interested in working with people with disabilities. The workshop trains yoga teachers to consider sequencing in classes for people with varying needs, examine the need and responsibilities of teaching and assisting, and to observe and practice teaching a yoga class with JoAnn's students. Two weekly asana classes and one monthly yoga nidra class is currently offered to cancer patients and care givers at the Cancer Support Community in Walnut Creek. These classes blend gentle active and restorative yoga, mindful breath, and mudras to stimulate the body's natural healing ability. Yoga Nidra is also offered which guides body and mind into a state of deep relaxation to promote a sense of well-being. This compassionate and adaptive style of practice encourages students to find a deeper acceptance and understanding of themselves during this life-changing medical crisis. Classes are led by Cheryl Fenner Brown, a professional yoga therapist who has specialized in teaching cancer patients since 2007. She also serves on the faculty of the Niroga Institute's yoga therapy program. She has trained a team of volunteer assistants who help her with the yoga for cancer classes. These classes are offered free of charge for the participants. Cheryl Fenner Brown, PYT has been conducting research on how yoga affects cancer treatment side effects since 2011 and offers this eight-week session annually at the Cancer Support Community in Walnut Creek. It focuses on simple gentle yoga techniques that reduce the severity of cancer treatment side-effects and participants report their levels of anxiety, fatigue, pain, sleep disturbance, digestive disturbance, and cognitive disturbance after the weekly yoga class consisting of gentle movement, breathing, mudras, yoga nidra and other relaxation techniques. This series of workshops is presented by experts in their field and is intended for teachers, caregivers and medical professionals and will explore how yoga can help with some of the physical challenges that many face. They are sponsored by the Piedmont Yoga Community and held at Piedmont Yoga in Oakland. Topics over the past year have included yoga for cerebral palsy, jaw tension, cancer, developmental disabilities, scoliosis, Parkinson's, happy hips & low back, and sciatica. Piedmont Yoga Community has been a grant recipient of Yoga Dana Foundation since 2007.